1. Preheat oven to 400 F. In a large bowl, cream butter, sugar, and almond extract. 2. In a medium-sized bowl, combine flour, baking powder, and salt. 3. Add dry ingredients to wet until a dough forms. Roll dough into 1-inch balls and place on an ungreased cookie sheet. 4. Flatten dough balls to about 1/4-inch thickness with the bottom of a buttered glass. Sprinkle sugar over top of cookies. 5. 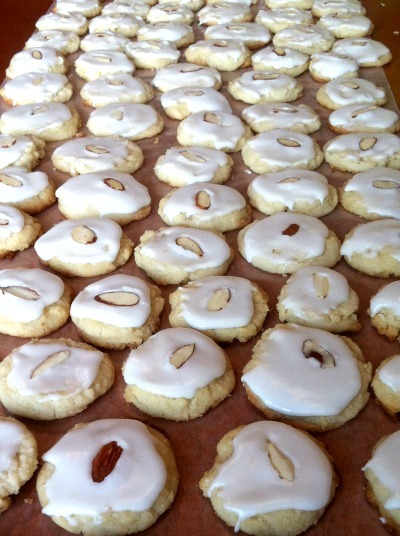 Bake for 7-9 minutes, or until cookies are set and edges are slightly brown. Cool completely before glazing. Glaze recipe follows. 1. Combine powdered sugar, almond extract, and water in a large bowl and mix until a smooth glaze forms. 2. 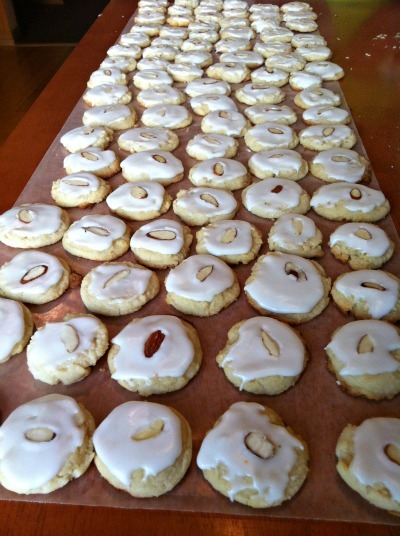 Glaze cooled almond cookies and place a sliced almond on top. Enjoy! These sounds delicious! I love almond butter!! I’m going to try to make these soon for sure!